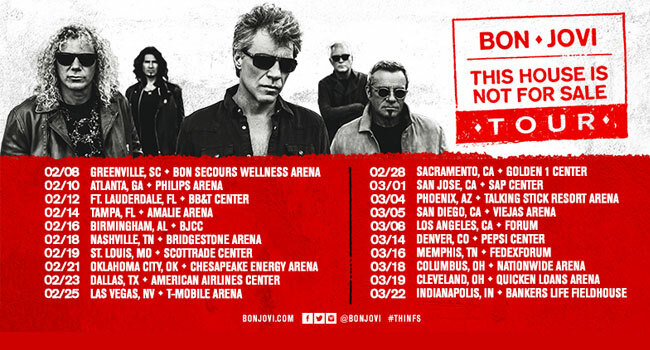 Grammy Award-winning band, Bon Jovi has announced that the This House Is Not for Sale Tour, presented by Live Nation, will kick off in February 2017. Hitting arenas across the U.S., the iconic rock band will present anthems, fan favorites, and new hits from their upcoming 14th studio album, This House Is Not for Sale (now due November 4th on Island/UMG). As an added bonus, fans will receive a physical copy of This House Is Not For Sale with every ticket purchased. This will be the band’s first outing since Bon Jovi’s 2013 Because We Can World Tour, which was their third tour in six years to be ranked the #1 top-grossing tour in the world (a feat accomplished by only The Rolling Stones previously). Bon Jovi’s touring legacy will be recognized November 9th with the 2016 “Legend of Live” award at the Billboard Touring Conference & Awards. As Bon Jovi rocks October to launch This House Is Not for Sale, the title track is already inside the Top Ten of the AC Radio Chart – it is Bon Jovi’s highest debut on that chart to date. Appearances/features are set with The Ellen DeGeneres Show (airing today), ABC’s Good Morning America, Nightline, Charlie Rose, Howard Stern, People and Billboard Magazine. On the road, the TIDAL X: Bon Jovi series brings Bon Jovi to four historic venues to perform live listening parties to reveal the album, start to finish, in New Jersey (Count Basie Theatre was held on October 1st), London (Palladium London, October 10th), Toronto (Queen Elizabeth Theatre, October 17th) and for the first time on Broadway for a TIDAL livestream (Barrymore Theatre, October 20th). This will be Bon Jovi’s first major release since What About Now (2013), the band’s 3rd consecutive multi-platinum album to debut at #1 on the Top 200 (Lost Highway in 2007, and The Circle in 2009). For the This House Is Not For Sale Tour, “Backstage with Jon Bon Jovi” Fan Club ticket pre-sales, including exclusive VIP packages, go on pre-sale on Monday, October 10th at 10 am local time (except Greenville, Sunrise, San Jose, San Diego, Memphis and Cleveland, beginning on October 17th). American Express Card Members can purchase tickets before the general public beginning Monday, October 10th at 10 am local time and ending on Friday, October 14th at 10 pm (except Greenville, Sunrise, San Jose, San Diego, Memphis and Cleveland on October 17th through October 21st). Live Nation pre-sales will begin Thursday, October 13th at 10 am local time (except Greenville, Sunrise, San Jose, San Diego, Memphis and Cleveland on October 20th). Public tickets will be available for purchase on Saturday, October 15th at 10 am local time (except Greenville, Sunrise, San Jose, San Diego, Memphis and Cleveland on October 22nd) at LiveNation.com and through participating venue Box Offices.